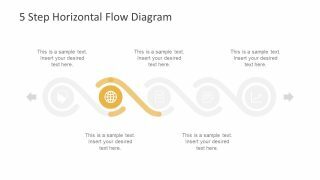 The 5 Step Horizontal Flow Diagram for PowerPoint is a brilliant presentation design for business processes. This is the timeline design to display interdepending sequence of processes in a horizontal view of activities. 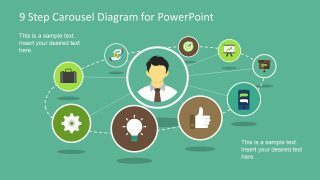 The template has a creative design of infographic icons for the continuous project activities. 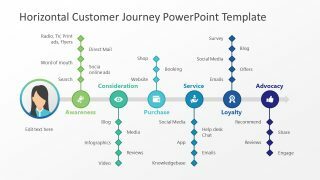 This PowerPoint is a business professional diagram of timeline to discuss strategies, guidelines and development models. 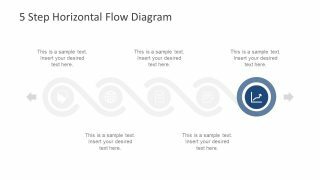 The horizontal flow diagram has five circular infographic segments with curve lines around. These curve lines demonstrate the smooth flow of activities in one direction by showing one curve line around the icon. The colorful diagram design also gives a gradient effect though these translucent curve lines. However, users can add real gradient effect of two or more colors from shape effects option of drawing format menu. 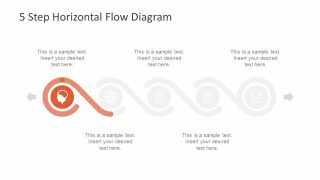 The 5 Step Horizontal Flow Diagram for PowerPoint is an incredible design to present complex models. 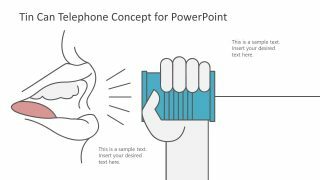 The graphical illustration of individual activity helps the audience to develop an interest and its mental image. 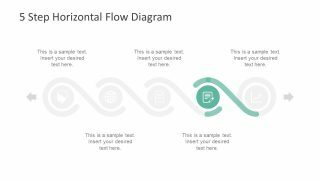 Therefore, the further 6 slides of this horizontal flow diagram template contain the layout to highlight every step. This feature enables audience to visualize the information of all five stages along with the notes and useful textual content. 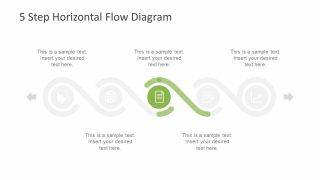 Hence, the users can add textual content, alter its size and font in editable horizontal flow template. 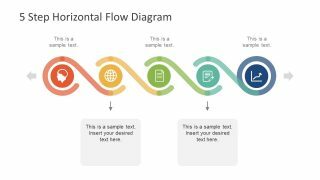 Moreover, the infographics in the horizontal timeline diagram are usable in various concept presentations. For instance, the report, globe, human head and trend charts are all presentable in every industry relevant topics. 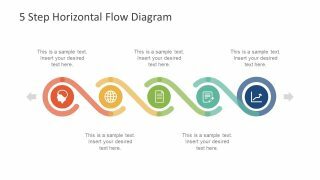 The Creative diagram design of 5 Step PowerPoint presents the connection of activities in a horizontal flow timeline template. 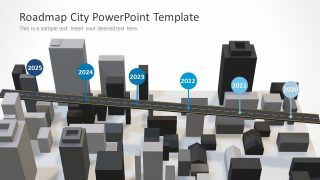 The PowerPoint timeline diagram can present number of five step business models. For example, sales process, problem solving, risk and conflict resolution etc. Further, the template has more versions available in SlideModel diagrams section including this 7 step horizontal flow.